I love the feel and quality of these towels. They are ideal for application of quick waxes. ProsVery soft and never leaves lint behind. Best microfibers I have used yet. This is my second 3-pack of these towels. Hands down, they are amazing. SUPER SOFT. Remind me of Santa's coat fur. haha. Excellent at picking up whatever product it is that you lay down... Mists, Sprays, Polishes, Synthetics... you name it. ProsEverything you could ever want out of a microfiber. ConsNothing. Definitely worth the price! Used this product to remove wax and it worked great. Extremely soft and did not leave streaks. 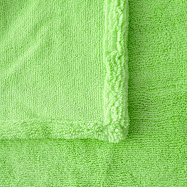 Super soft is a great name as these are very soft and very bright green. 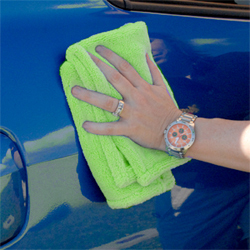 Its a great towel buy these with confidence that you are getting a good quality soft towel. These are the same as the blue cobra rolled edge which are my favourite towel. I use them for polish removal, QDs, spraywax, final wipes, you name it. Stay away from the speedshine towels they lint and are poopy compared to these.